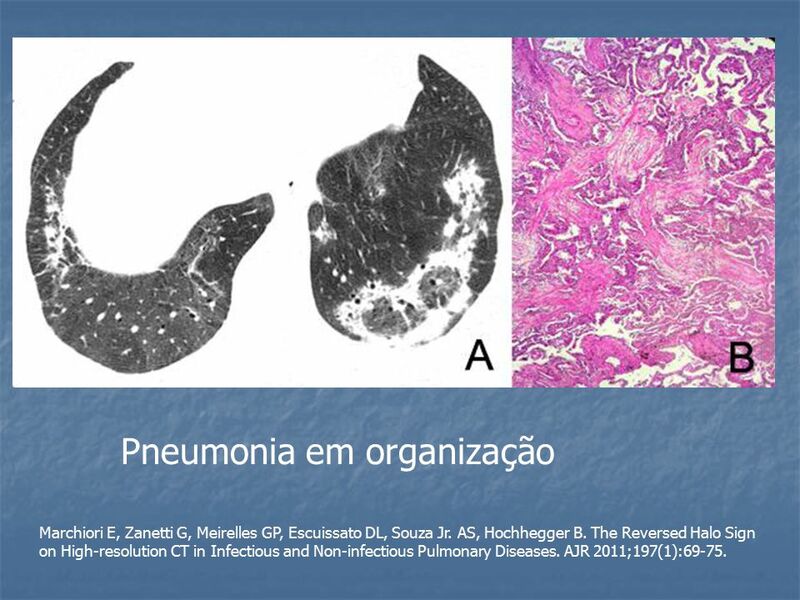 pneumonia: diagnostic implications. 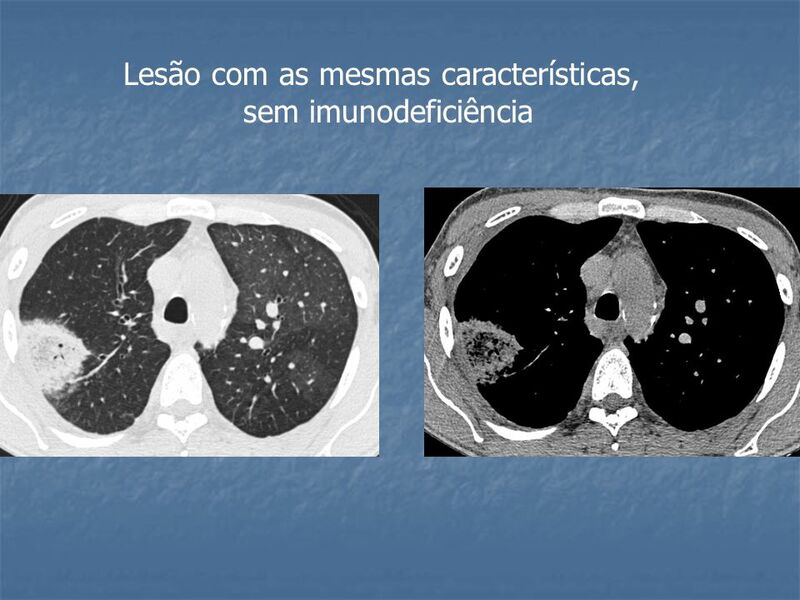 AJR 2003;180:1251–1254. 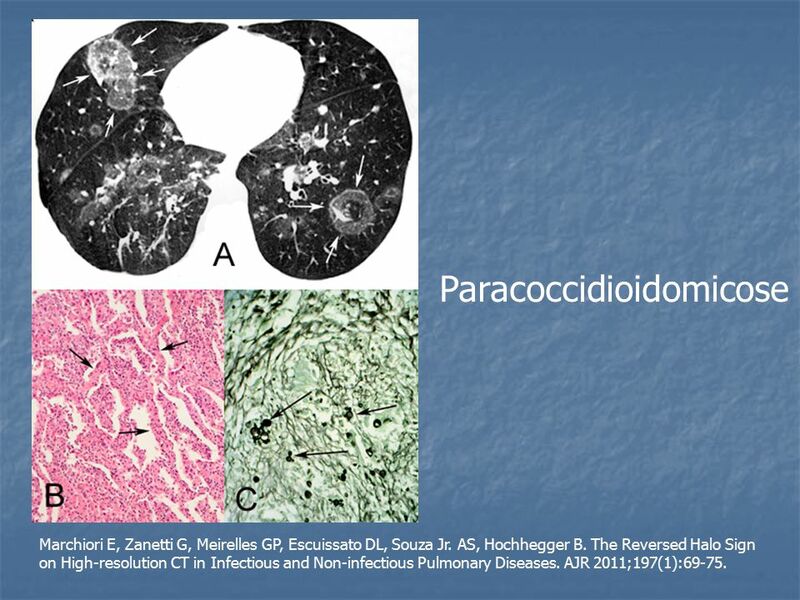 INFECCIOSAS Paracoccidioidomicose Tuberculose Aspergilose; zigomicose Criptocococose Histoplasmose Esquistossomose Pneumocistose NÃO INFECCIOSAS Pneumonia em organização (criptogênica ou secundária) Carcinoma bronquiolo-alveolar Edema pulmonar Infarto pulmonar Granulomatose de Wegener Sarcoidose Marchiori E, Zanetti G, Meirelles GP, Escuissato DL, Souza Jr. AS, Hochhegger B. 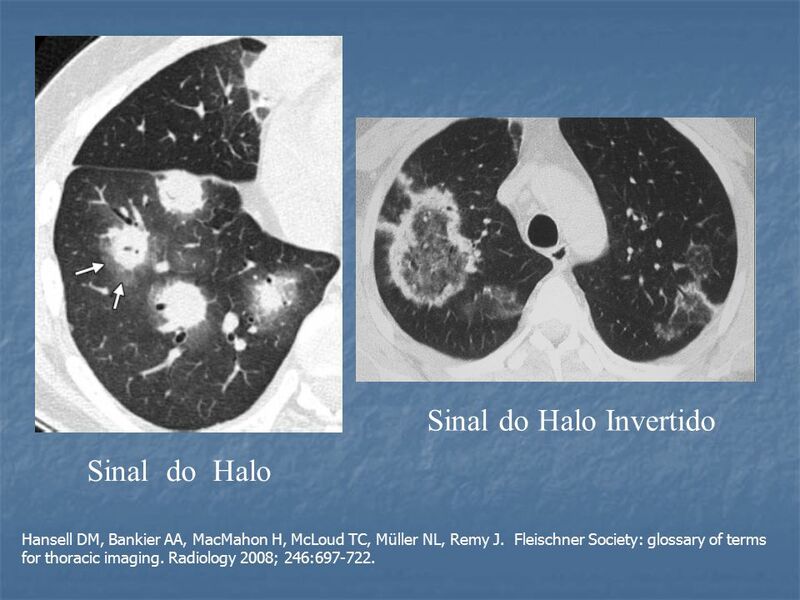 The Reversed Halo Sign on High-resolution CT in Infectious and Non-infectious Pulmonary Diseases. 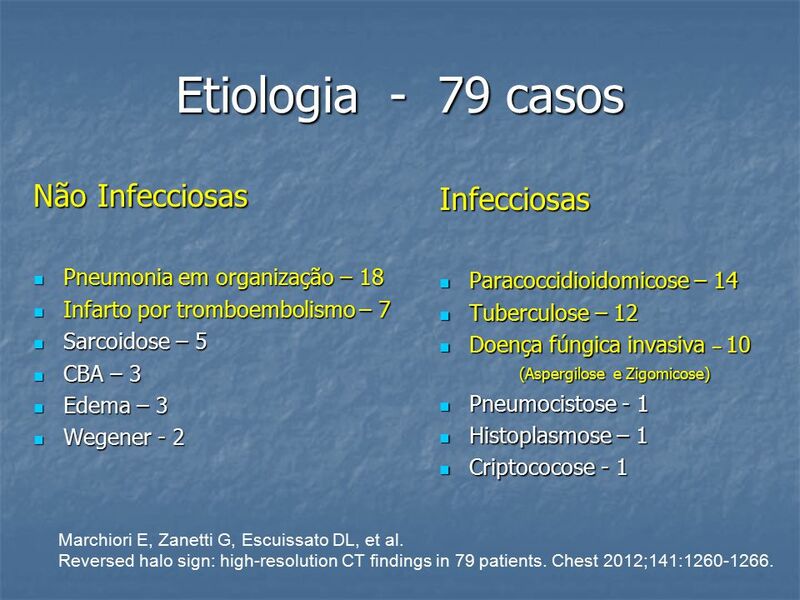 AJR 2011;197(1):69-75. Marchiori E, Zanetti G, Meirelles GP, Escuissato DL, Souza Jr. AS, Hochhegger B. 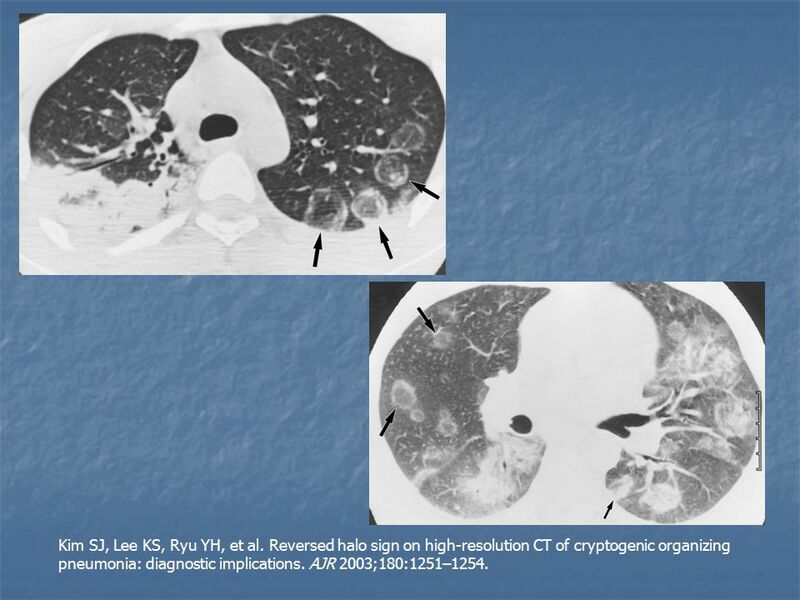 The Reversed Halo Sign on High-resolution CT in Infectious and Non-infectious Pulmonary Diseases. 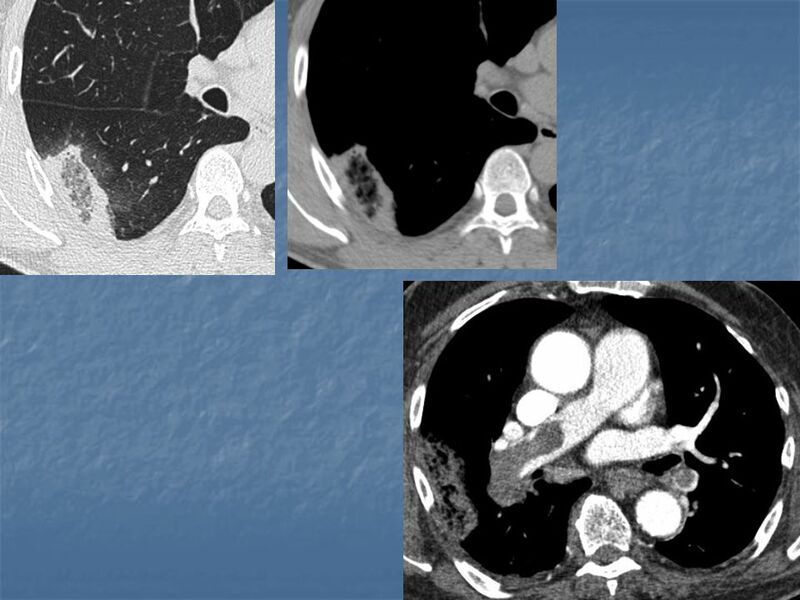 AJR 2011;197(1):69-75. 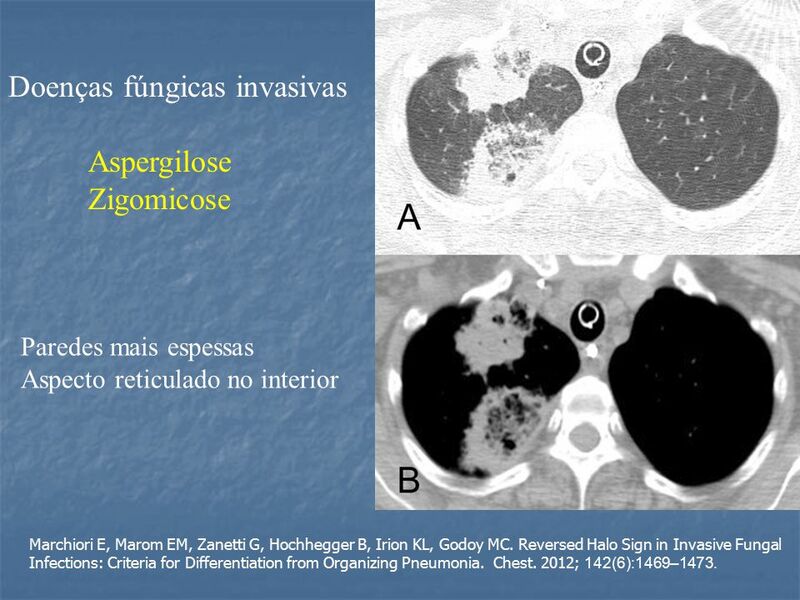 6 Aspergilose invasiva Marchiori E, Zanetti G, Meirelles GP, Escuissato DL, Souza Jr. AS, Hochhegger B. 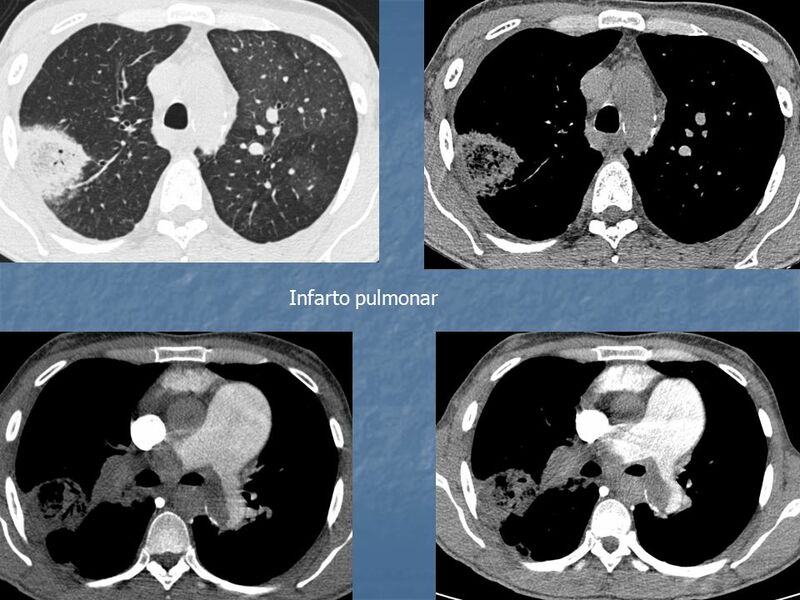 The Reversed Halo Sign on High-resolution CT in Infectious and Non-infectious Pulmonary Diseases. 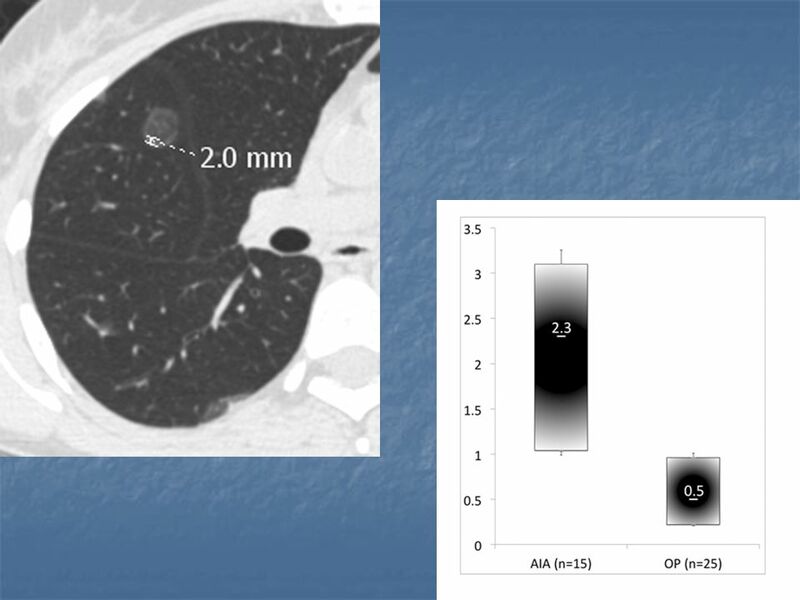 AJR 2011;197(1):69-75. 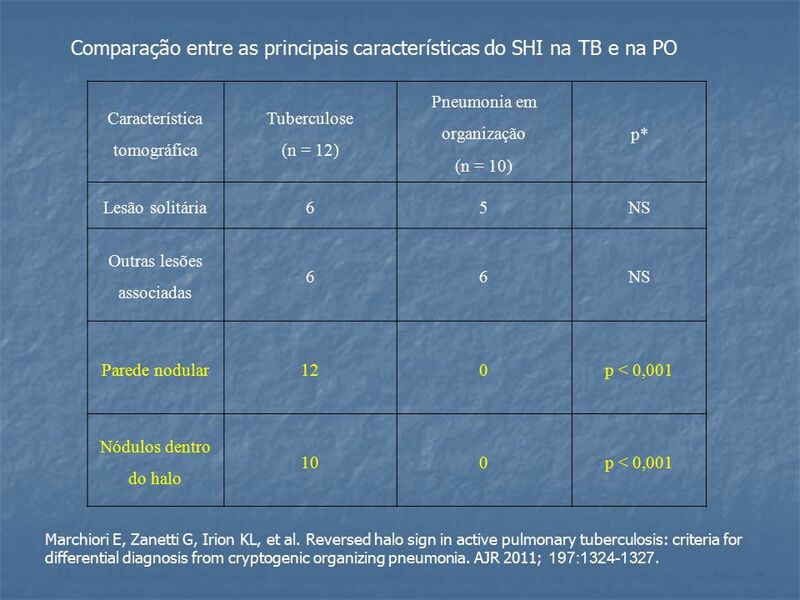 11 Tuberculose Marchiori E, Grando RD, Simões Dos Santos CE, et al. 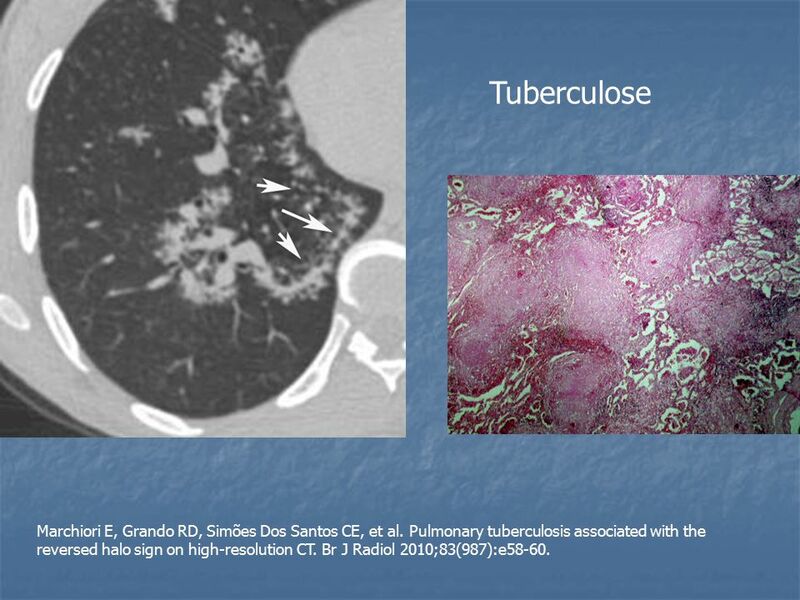 Pulmonary tuberculosis associated with the reversed halo sign on high-resolution CT. Br J Radiol 2010;83(987):e58-60. 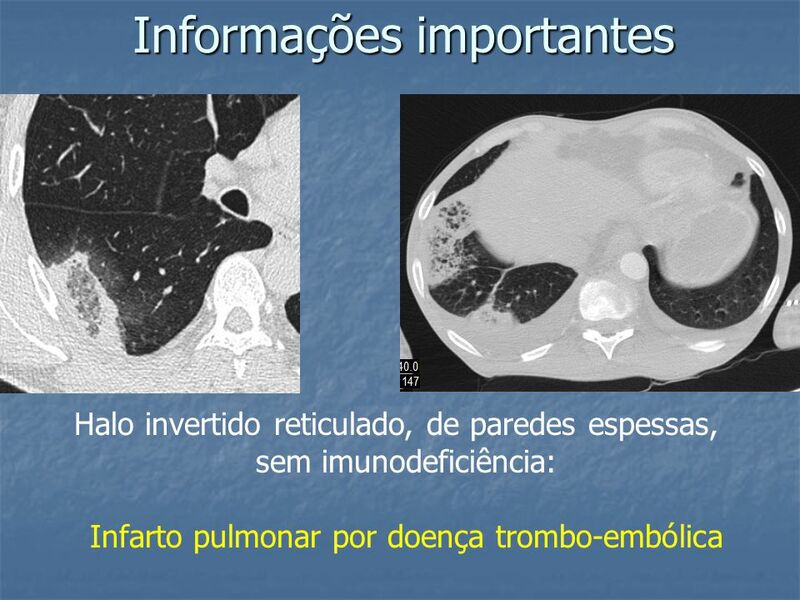 13 Tuberculose Marchiori E, Zanetti G, Irion KL, Nobre LF, Hochhegger B, Mançano AD, Escuissato DL. 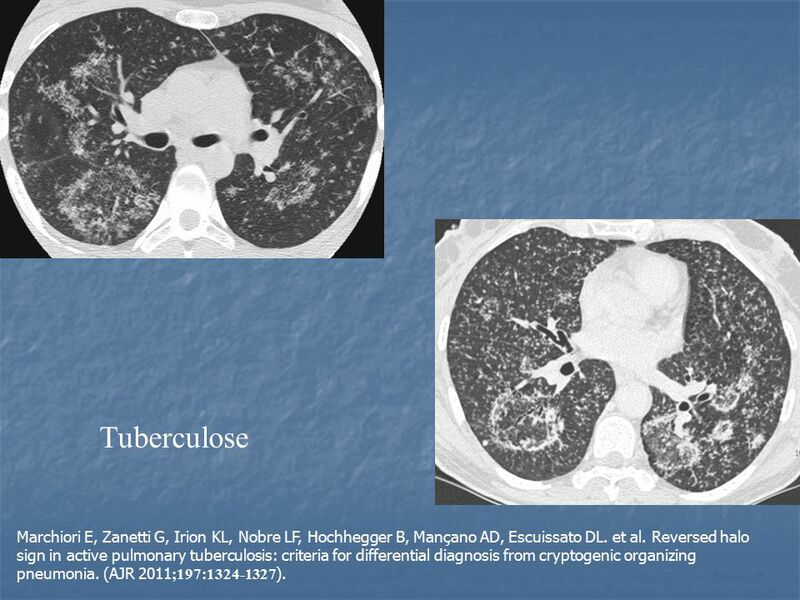 et al. 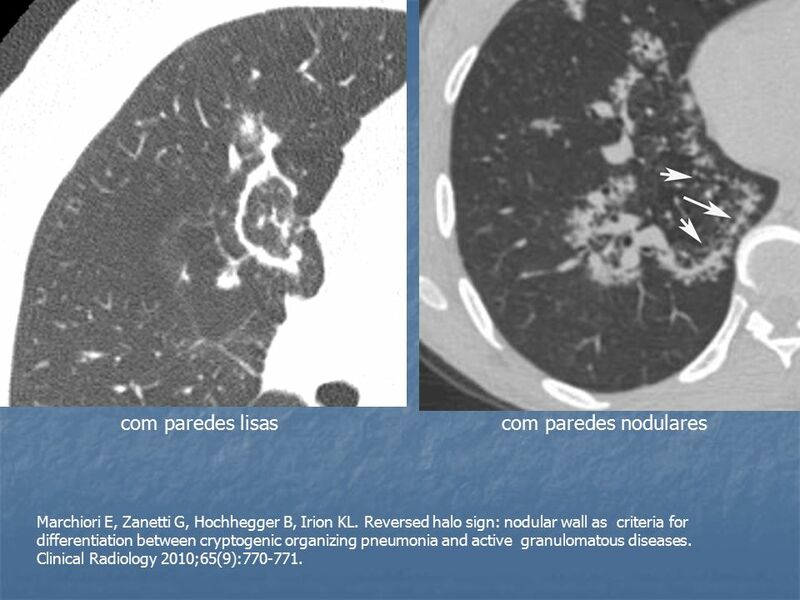 Reversed halo sign in active pulmonary tuberculosis: criteria for differential diagnosis from cryptogenic organizing pneumonia. 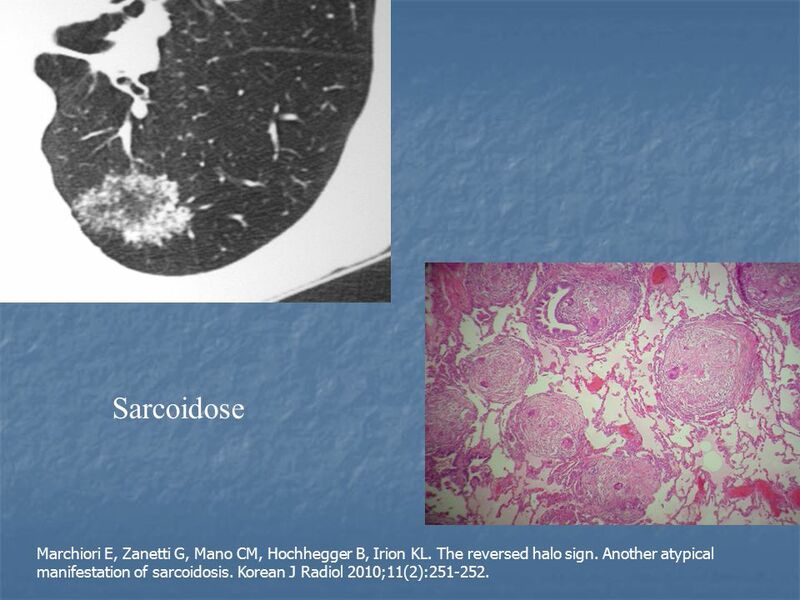 (AJR 2011;197: ). 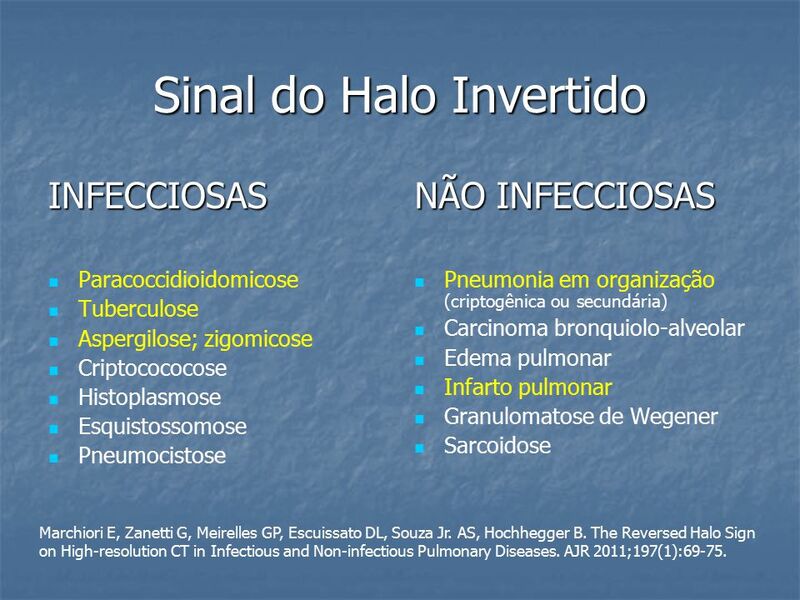 Paredes mais espessas Aspecto reticulado no interior Marchiori E, Marom EM, Zanetti G, Hochhegger B, Irion KL, Godoy MC. 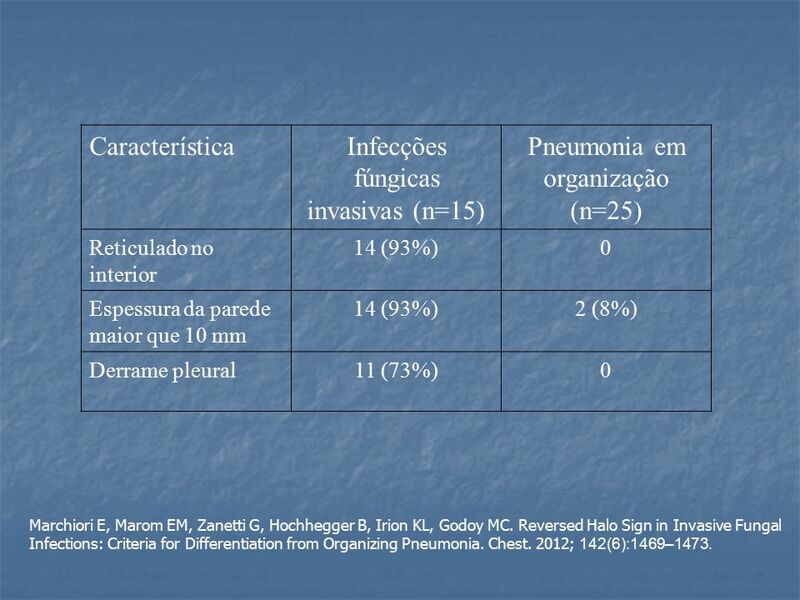 Reversed Halo Sign in Invasive Fungal Infections: Criteria for Differentiation from Organizing Pneumonia. Chest. 2012; 142(6):1469–1473. 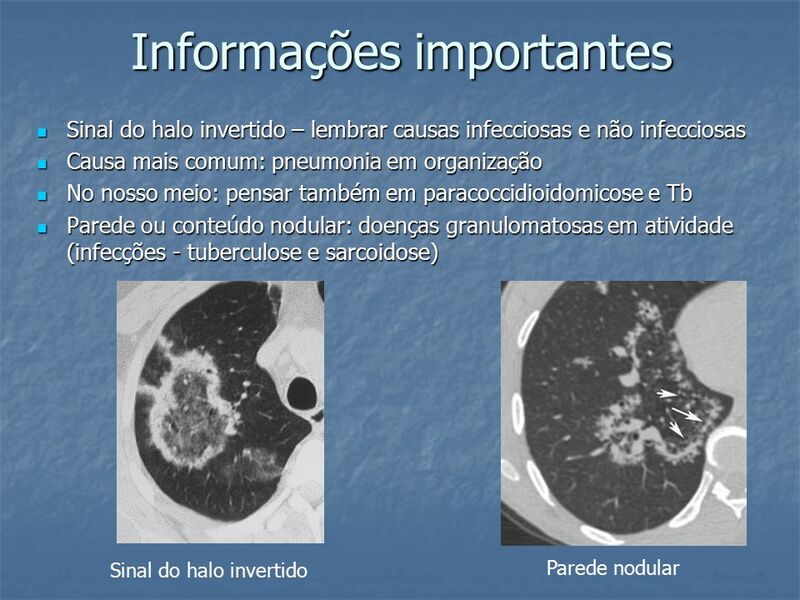 Característica Infecções fúngicas invasivas (n=15) Pneumonia em organização (n=25) Reticulado no interior 14 (93%) Espessura da parede maior que 10 mm 2 (8%) Derrame pleural 11 (73%) Marchiori E, Marom EM, Zanetti G, Hochhegger B, Irion KL, Godoy MC. 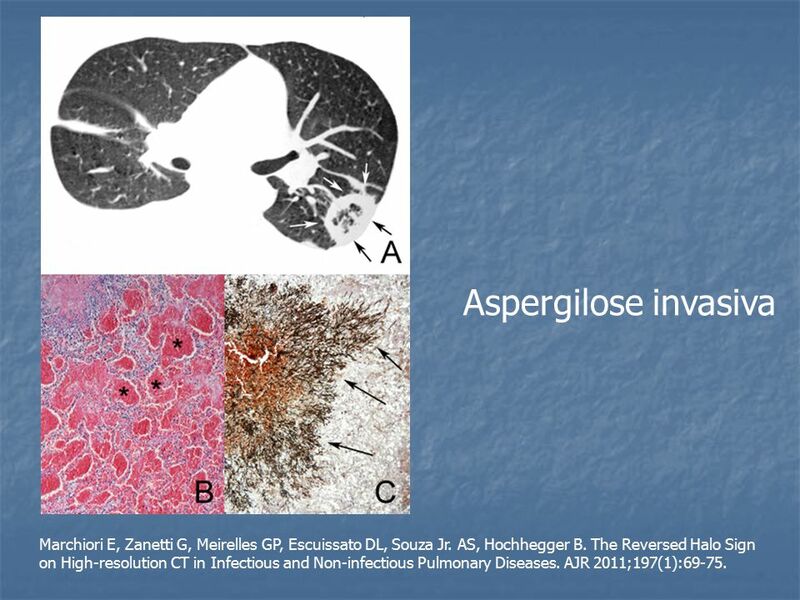 Reversed Halo Sign in Invasive Fungal Infections: Criteria for Differentiation from Organizing Pneumonia. Chest. 2012; 142(6):1469–1473. 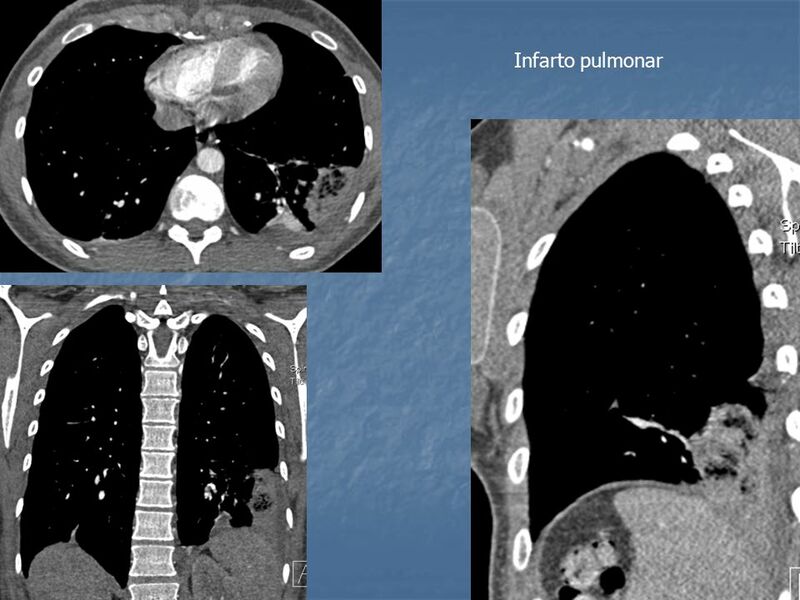 17 Aspergilose invasiva Marchiori E, Godoy MC, Zanetti G, et al. 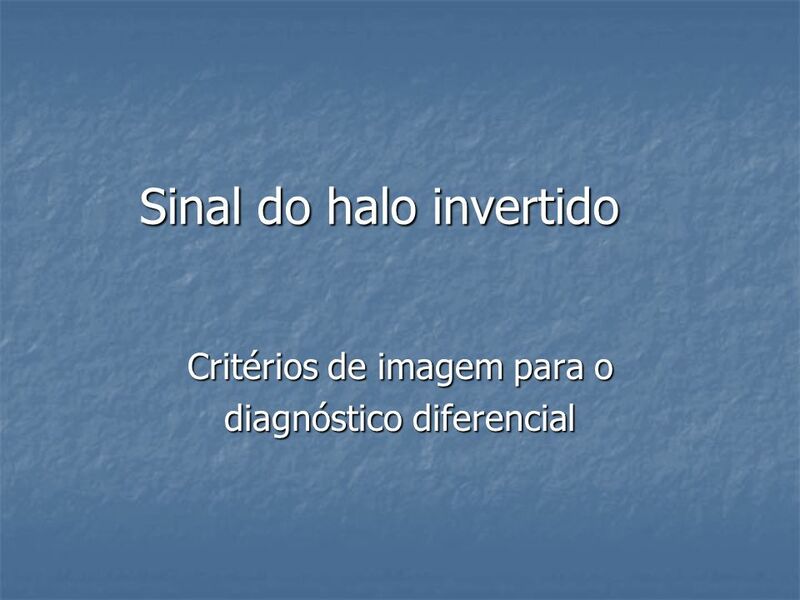 The reversed halo sign. 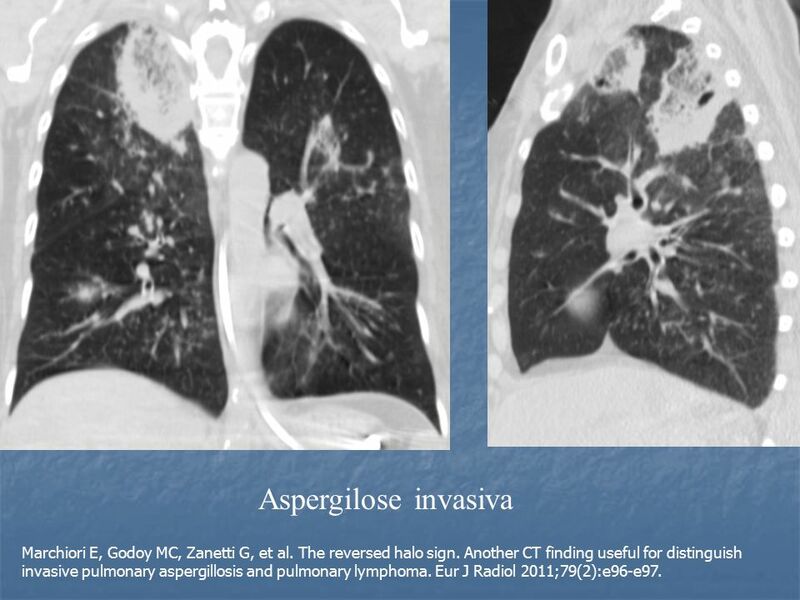 Another CT finding useful for distinguish invasive pulmonary aspergillosis and pulmonary lymphoma. 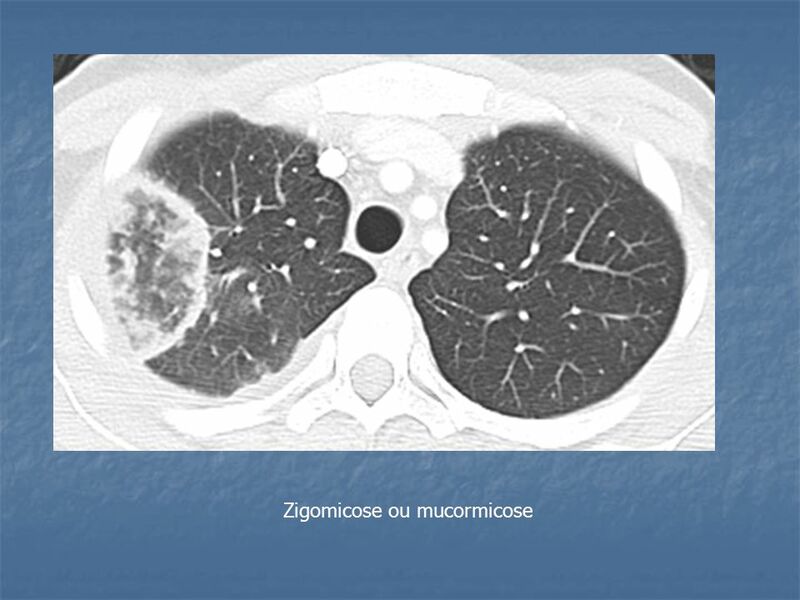 Eur J Radiol 2011;79(2):e96-e97. 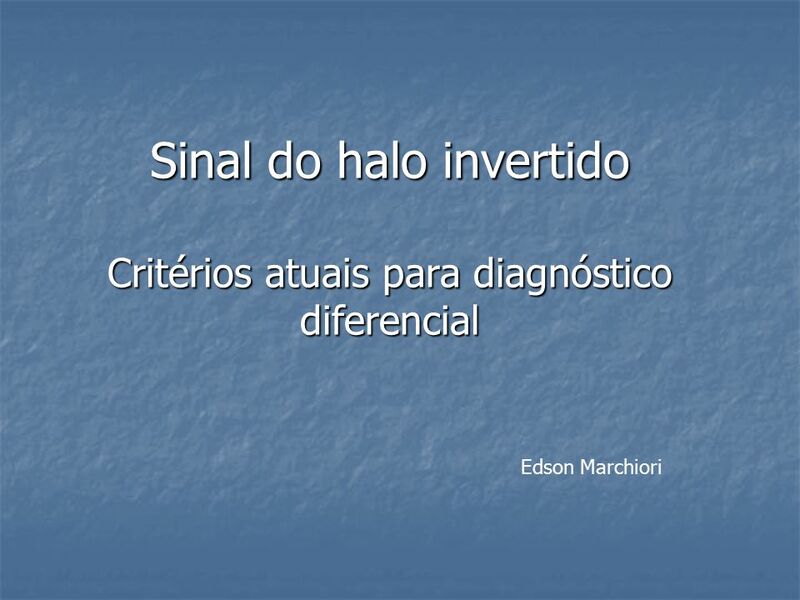 Carregar ppt "Sinal do halo invertido Critérios atuais para diagnóstico diferencial"
Nascimento, L. C.; Corso, P. F. C. L., Delson, J. C.
DEPARTAMENTO DE IMAGEM DA SBPT Prof. Domenico Capone Chefe do Serviço de Diagnóstico por Imagem do HUPE/UERJ Prof. Adjunto de Pneumologia da UERJ Radiologista. 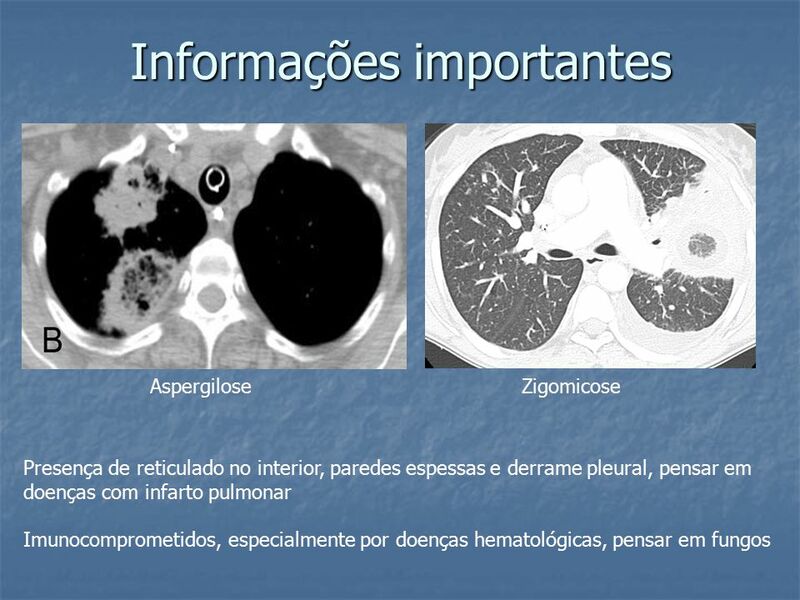 Dimensão e características da epidemia em Portugal: o que sabemos e o que precisamos de saber Dados epidemiológicos em UDI e em reclusos Raquel Lucas Faculdade.